Each wine bottle stored on this five column individual bottle wine rack is cradled on customized rails that are carefully manufactured with beveled ends and rounded edges to ensure wine labels will not tear when the bottles are removed. Purchase two to stack on top of each other to maximize the height of your wine storage. Assembly required. 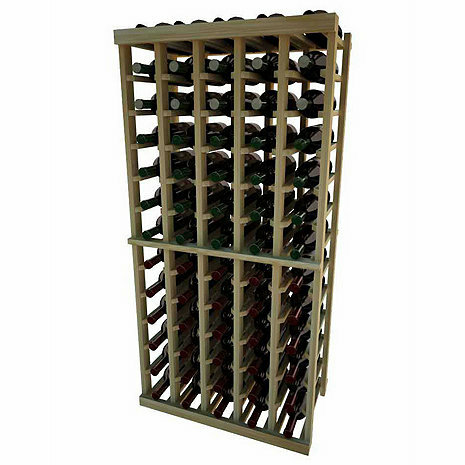 The Napa Vintner Stackable 5 Column Individual Bottle wine rack is a modular system crafted from premium redwood that gives a custom appearance at a mass produced price. These wine racks may be stacked on top of one another to reach a height starting at 95 1/16", and with multiple molding packages may go as high as 104 5/16", as well as multiple heights in between. The Vintner Series offers a wide variety of racking options, along with the ability to mix and match racking heights and styles. This wine rack collection was designed to accommodate wine bottles that are 3 - 3 1/2" in diameter. In addition to unstained redwood, the Vintner Series is also available in different stain options: classic mahogany, dark walnut, and midnight black. Made in the USA. The Napa Vintner Stackabl 5 Column Individual Bottle wine rack stores 65 wine bottles, 115 if stacked one on top of each other. Each bottle is cradled on two rails that are cut with beveled ends and rounded edges which ensure the labels will not tear when the bottles are removed. This wine rack has a display row built in to the center of the design so that wine labels can be visible. Purchase two to stack on top of each other to maximize the height of your wine storage. Moldings and platforms sold separately. Is it possible to add a table top to the 5-column individual rack? I can't see why not. I plan to on mine. A table top such as a piece of cedar perhaps which could act as a serving counter or other. does anyone make this style of pre-fab racks that are double deep? BEST ANSWER: Now that's an idea I hadn't thought about. Sounds like a good idea but if I were to do it I would do them so I could get to both sides and attach the units with zip ties so they wouldn't splay apart with the wine bottle weight. We had an odd little space in our basement and were able to use this rack and a couple others to build an approx 500 bottle cellar. The racks were easy to assemble and look great. Wood quality was excellent. Initially I was concerned as I began assembling the wine rack because it seemed unstable, but once I attached it to the wall in our basement it is solid enough. I was relieved. It takes two people to assemble thank goodness my brother in law is handy. It is not difficult once you figure out what you are doing, just a small hammer and nails. We built a small platform to raise the rack for easier access and it works out great! My only problem, I should have ordered a larger unit.